This article is about WaterSense Toilets. Al’s Plumbing, Heating & A/C provides full service plumbing maintenance, repairs and replacements for every plumbing component in your home. Al’s sells and installs Rheem Professional Series gas & electric water heaters, and tankless water heaters. Al’s Plumbing, Heating & A/C is near your home in Plano, Allen, and Frisco. We service all homes in southern Collin and Denton Counties with no additional travel charge. WaterSense Toilets Use 1.28 Gallons Or Less. Toilets installed before 1/1/1994 used as much as 6 gallons of water per flush. The current federal standard is 1.6 Gallons Per Flush (GPF). Replacing a water-wasting toilet with a new 1.6 GPF toilet reduces water usage by up to 75%, and pays for itself over time. Installing a WaterSense toilet further reduces water usage by 20% or more. A WaterSense Toilet Uses 1.28 GPF Or Less. They Are Required To Use At Least 20% Less Water Than Standard 1.6 GPF Toilets. WaterSense is sponsored by the U.S. Environmental Protection Agency (EPA). The WaterSense label makes it easy to identify water-efficient products. WaterSense products must meet the EPA’s criteria for efficiency & performance. WaterSense-labeled products must use at least 20% less water + perform as well as or better than regular models. Recent advancements have allowed a WaterSense toilet to use 1.28 gallons per flush or less while still providing equal or superior performance to 1.6 GPF Standard Toilets. 1.28 GPF is 20% less water than the current federal standard of 1.6 gallons per flush. The WaterSense label is used on toilets that are independently certified to meet criteria for both performance and efficiency. Only toilets that complete the certification process can bear the WaterSense label. The Higher Your Water Charges Are, The Better Investment A WaterSense Toilet Becomes. At 20,001–40,000 gallons per month = 1,000 gallons of water costs $7.41 (for the water) + $5.80 (for the sewer) = $13.25 per 1,000 gallons of water. 1994–TODAY: A Std.-Efficiency Toilet 1.6 GPF. With 7,031 ** flushes per year, a family of 4 will use 10,750 gallons of water per year for toilet flushing. With a High-Efficiency Toilet 1.28 GPF. With 7,031 ** flushes per year, a family of 4 will use 9,000 gallons of water per year. The WaterSense Toilet savings in Plano would be $23.15 per year (at $13.25 / 1,000 gallons of water). BEFORE 1994: Older toilets use an average of 6 GPF. With 7031 ** flushes per year, a family of 4 will use 42,175 gallons of water per year flushing toilets. With a High-Efficiency Toilet 1.28 GPF. With 7031 ** flushes per year, a family of 4 will use 9,000 gallons of water per year. The WaterSense Toilet savings in Plano would be a slightly more than $435.00 per year! (at $13.25 / 1,000 gallons of water). 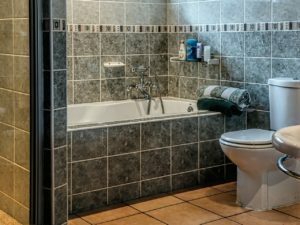 Does WaterSense Toilet Clog More Easily? The most commonly known industry test of toilet-flushing performance is the Maximum Performance (MaP) Test. A score is assigned based on how well toilets successfully remove a specified amount of waste from the bowl in a single flush — the greater the score the better. A soybean paste, having similar physical properties (density, moisture content) to human waste, is used in combination with toilet paper for the test. The U.S. Environmental Protection Agency (EPA) adopted 350g (about 3/4 of 1 pound) of soybean paste as the minimum performance threshold for a high-efficiency, WaterSense toilet. This was determined to be the average weight of waste produced in a single use. MaP is the industry standard for toilet testing. Manufacturers voluntarily submit their toilets to be tested to earn the MaP certification. MaP uses realistic, organic-based, test media to accurately simulate realistic toilet demands. MaP is the only third-party testing method that certifies toilet performance of up to 1000 grams (2.2 pounds) of organic waste removal. A review of results from MaP testing (link above) show several American Standard toilets scores to be “Equal or greater than 1,000 – Highly Recommended”. A review of several Home’s Depot’s Glacier Bay brand (sold only by Home Depot) toilets shows the same ratings. High-Efficiency, Water Sense Toilet “Myth’s & Facts” — From The EPA. First, we state that toilets are designed, and to be used only for disposal of human waste & toilet paper. Flushing anything else is likely to eventually cause a clog — regardless of how much water the toilet uses per flush. FACT: WaterSense labeled toilets are designed to perform properly with less water. Lower flow = less flushing power? 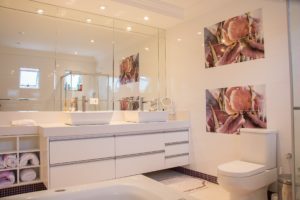 New technology and design advancements allow today’s high-efficiency toilets to flush better than yesteryear’s first-generation low-flow toilets from the mid to late 1990’s. Performance increases in standard-use toilets over the years provided the basis for today’s high efficiency toilets’ designs. WaterSense toilets have increased performance, using less water, than standard 1.6 GPF toilets due to a different design. WaterSense labeled toilets meet the EPA’s efficiency & performance requirements. It is expected that double-flushing and clogging should not be an issue. WaterSense labeled high-efficiency toilets meet or exceed all national plumbing standards required of all toilets. Today’s national plumbing standards are based on the exclusive use of PVC (white plastic) sewer pipes. NOTE: Many Older Homes Have Cast Iron Sewer Pipes. Today’s Homes Have PVC Sewer Pipes. There Is More Water-Flow Resistance With Cast Iron Pipes (due to rust inside them). This May Be A Problem With WaterSense Toilets. MYTH: High-efficiency toilets are expensive. FACT: The cost-difference today is minimal. In the following section, we demonstrate the cost-difference for Water Sense toilets today is actually quite small. Below you will see that American Standard charges only +$6 to upgrade to WaterSense from a standard-efficiency 1.6 GPF toilet. Glacier Bay Dual-Flush 1.1 GPF / 1.6 GPF = $100.00 ** This model offers two different water-volume flushes. 1 for liquids & 1 for solids. Glacier Bay is a value-priced brand. Kholer and American Standard are premium-priced brands. A WaterSense shower head can notably to dramatically reduce water usage (base on existing shower head). And, like the toilets, a WaterSense shower head will by far out perform earlier low-flow shower heads. The first-generation low-flow shower heads simply had an insert that allowed less water through. Today’s WaterSense shower heads are designed to give good performance with lower water usage. A standard showerhead uses at least 2.5 gallons of water per minute (GPM). If you shower for 7 minutes (a typical time estimate), you use up 17.5 gallons of water per shower, or about 525 gallons per month. Compared to a high-efficiency, WaterSense shower head using 2.0 GPM and you reduce water usage to 14 gallons per 7-minute shower. Your 20% water savings extends beyond water usage. You also reduce the cost to heat the water. With a family of 4 taking daily showers, and using the averages above = 70 gallons of water per day, or 2,100 gallons per month. Installing WaterSense shower heads reduce water usage by at least 20%, or 425 gallons of water per month. You also reduce the cost to heat the water by 20%. In Plano, TX, with household is using 5,000–20,000 gallons of water per month, the cost= $3.71 per 1,000 gallons of water used PLUS $3.71 for sewer charges. At $7.42 per 1000 gallons, a WaterSense shower head saves $3.15 per month. WaterSense shower heads cost as little at $18 per month. The water savings alone would pay for the shower head in 6 months. This does not factor in the cost to heat the water. Gas Water Heater: $13.50 to heat 1,000 gallons. Electric Water Heater: $21.50 to heat 1,000 gallons. Al’s Plumbing, Heating & A/C provides full service plumbing maintenance, repairs and replacements for every plumbing component in your home. Al’s sells and installs Rheem Professional Series gas & electric water heaters, and tankless water heaters. Al’s Plumbing, Heating & A/C is near your home in Murphy, Wylie, Rowlette, Texas. We service all homes in southern Collin and Denton Counties with no additional travel charge.